In a post back in November on English editions of Lord Shaftesbury’s Characteristicks of Men, Manners, Opinions, Times, I had a few things to say about the emblematic engravings that Shaftesbury designed to illustrate his work. In 1974 Felix Paknadel wrote what still remains the most detailed account of the symbolism encapsulated in these engravings. Although anyone interested in the subject must ever be grateful for Paknadel’s effort, a new attempt at interpretation is long overdue. I would like to give an idea of what I mean. Of being cheated, as to cheat. The more th’ admire his slight of hand. As noozes by the Legs catch Foul." To the nets? You have hearkned to the last too much." 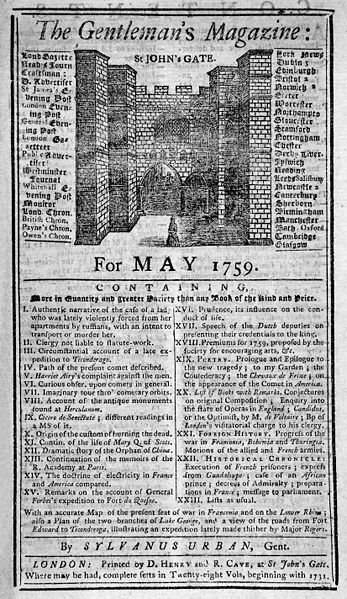 The Butler passage seems the more important, in that a major theme Shaftesbury is illustrating here is superstition and its duperies, a major theme in the “Miscellaneous Reflections”. The first French edition of Joseph Andrews (London, 1743) calls it éclairer l’oiseau. Interestingly, some modern editions, including the most recent Oxford World Classics edition, replace “Bird-batting” with “Bird-baiting”. This is a mistake. First of all, it is not a typographical error. The separate first Dublin edition also has “bird-batting”, as does the “revised and corrected” second London edition. Second, more detailed accounts of the practice describe it as consisting of beating the bushes, and then using a lantern to see where to hold the net. In other words, the person who beat the bushes could be characterized as the “pitcher”, and the person or persons holding the lantern and net would be the “batters”. In fact, the sense was even more literal: instead of a net, a bat was commonly used to stun or kill the startled birds. Furthermore, an alternative name for the practice is “bat-fowling”, an obvious play on words for that other winged creature that flies at night. Reverse the order of the words in “bird-batting” and you get “bat-birding” or “bat-fowling”. ANTONIO. ‘Twas you we laughed at. in it five weeks without changing. me asleep, for I am very heavy?" 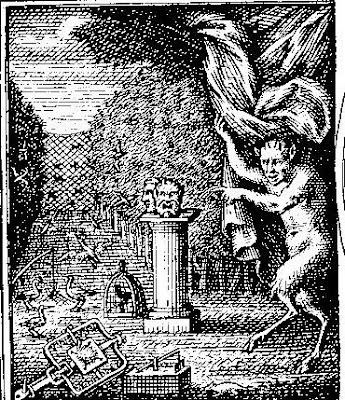 In Rochefoucauld’s frontispiece, a laughing cherub (rather than Shaftesbury’s satyr) points to a bust of Seneca, the pedestal of which contains the Latin inscription “QUID VETAT”. This is a reference to Horace, Satires, 1.1.24-25: “ridentem dicere verum / quid vetat?” (“what is to prevent one from telling the truth as he laughs?”). The same quotation became the motto on the title page of Shaftesbury’s “Letter concerning Enthusiasm” upon its re-publication in Characteristicks. Why was Seneca the target of ridicule for Rochefoucauld? For one thing, as a Stoic, Seneca had what the cynical Frenchman would consider to be an over-inflated opinion of the nobility of human nature. For another, Seneca took himself very seriously (and unlike Horace, wrote tragedies rather than satires). Also, Seneca, the high-ranking courtier and politician under the emperor Nero, would have been anathema to the politically embittered and cynical Rochefoucauld, living under the absolutist regime of Louis XIV. There is no indication of whom, if anyone, the busts in Shaftesbury’s design are intended to represent. 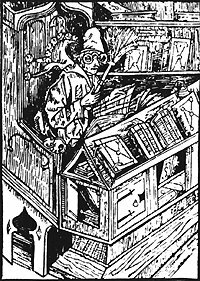 In his instructions to Gribelin, he merely refers to them as “a Set of Vizzard-Masks of several Kinds”. However, they bear severe — even angry — expressions, as did the bust of Seneca. 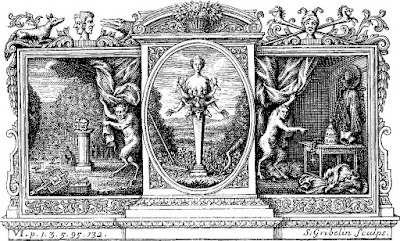 In the Rochefoucauld frontispiece, beneath the feet of the cherub, is inscribed “L’ amour de la verite” (“Love of truth”). The general idea being offered by both Rochefoucauld and Shaftesbury in these designs is that humour may be used to speak truth to power, whether those powers happen to be self-important politicians, or the Church. It is also worth noting that English editions of Rochefoucauld’s work tended to be titled Moral Maxims and Reflections, more than a little reminiscent of Shaftesbury’s title for the contents of Volume III of Characteristicks, “Miscellaneous Reflections”. 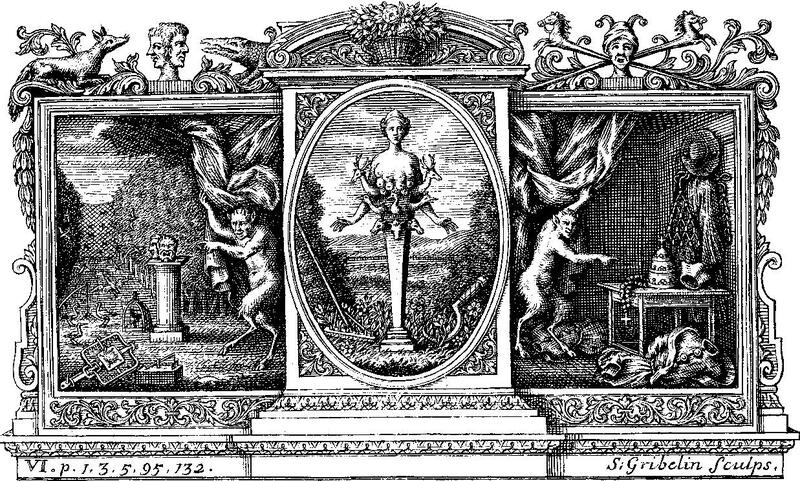 The Janus-faced nature of the bust being pointed to and laughed at by the satyr may also allude to the following passage of Characteristicks, Vol. 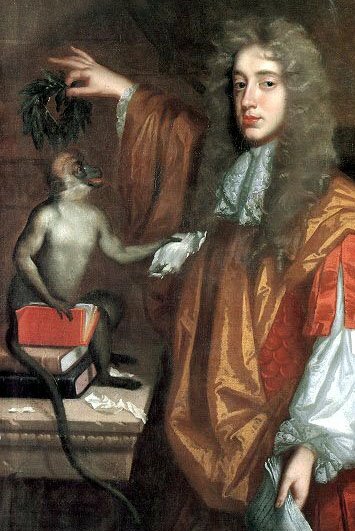 I, p. 66: “But at present there is nothing so ridiculous as this JANUS-Face of Writers, who with one Countenance force a smile, and with another show nothing but Rage and Fury.” The quote is from Shaftesbury's treatise in Vol. I, "Sensus Communis", where raillery is recommended for such hypocrites, symbolized by the satyr. All this rich texture of allusions, packed into one little section of this symbolically overstuffed headpiece, went largely unnoticed by Paknadel. Hence I think it is time for a new study.